Kevin is a 3rd Dan Black Belt in Hakuda Ryu Karate and a Bartitsu Instructor (a Victorian mixed martial art revival involving Savate, Le Canne, Pugilism and Ju Jitsu). 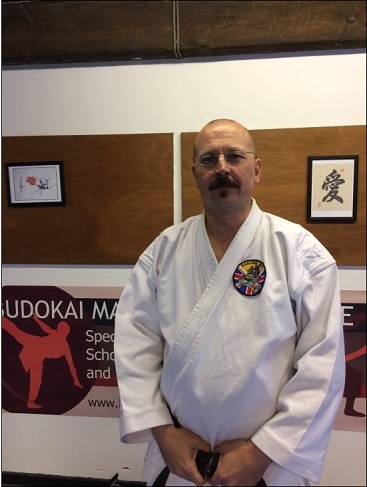 He currently works as the Technical Director of Budokai Martial Arts Limited and the Managing Director of the Hakuda Ryu Eastern Arts Centre. Budokai Martial Arts is a specialist provider of martial art training for primary school children using after school clubs, PPA Cover, Introduction days and karate fun days. The Hakuda Ryu Eastern Arts Centres provides training in Hakuda Ryu Karate, Kick Boxing and Bartitsu. It also holds ‘Activity Days’ during the school holidays. His aim is to get as many children away from computers and games consoles as possible and getting them physically active instead. “I started training in Tae Kwon Do whilst a youngster in Germany. However, when I returned to England I discontinued my training in Tae Kwon Do and started learning karate. This was an ‘ad hoc’ affair which I eventually gave up in my late teens. It wasn’t until I was 29 that I started training seriously with Shihan Alan Godfrey at the Surfleet Budokan. After four years of regular, and at times, intense training I attained my 1st Dan. At this point I moved to Yorkshire and, in 2002, opened my first martial arts club, in the village school hall, on a Tuesday evening. By 2003 I had started an additional session in my village and two further evening sessions in Cottingley, a village not too far away from where I live. From there I started teaching in primary schools as an ‘after school club’ provider specialising in the martial arts and the business steadily grew until what it is today.